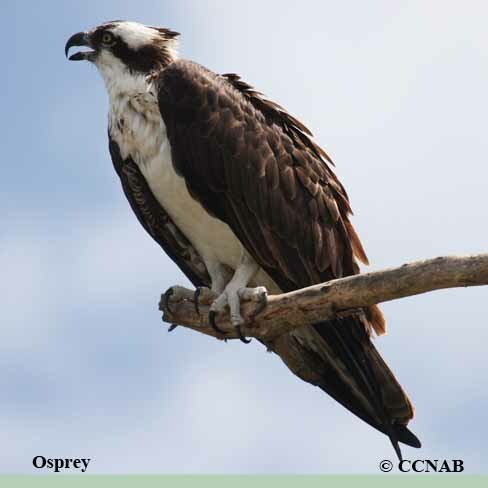 Species: The Osprey (Pandion haliaetus), once known as the Fish Hawk, preys almost entirely on fish. 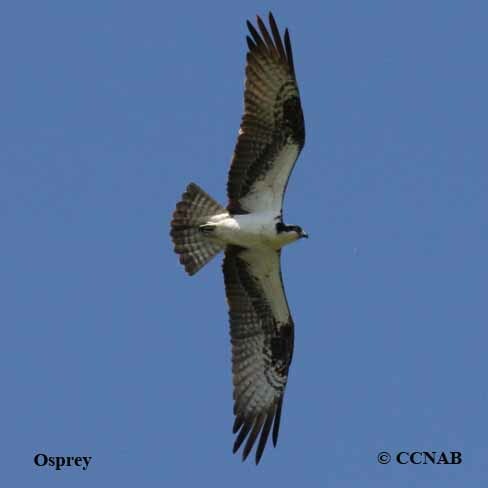 Seen mostly in the northern half of North America and its coastlines. The feet have long talons, with recesses on the toes, giving it the abilities to catch and hold slippery fish in a firm grasp. Larger than buteos, with a wing span almost comparable to an eagle, providing it the strength and power, to fly out of the water with its catch. 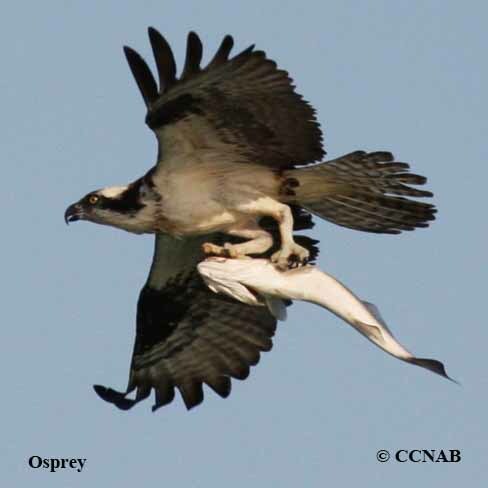 Sometimes, the Osprey, itself is preyed upon by the Bald Eagle, which forces it to drop its catch, whereas the eagle will pick up the fish for its own consumption. 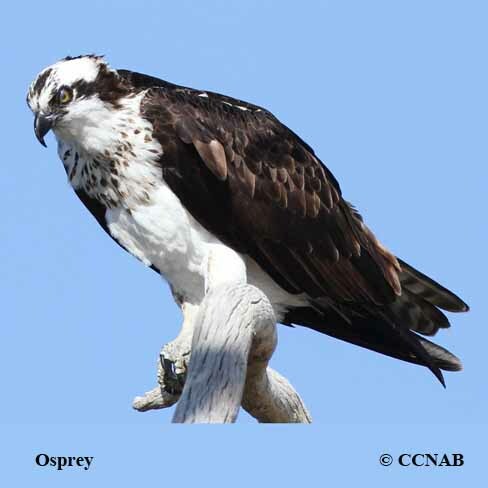 Distinctions: Adults are similar in appearance. Mostly all white underneath, multiple dark bands on tail. Long wings, with white and dark brown patterns, dark patches visible at front, where the wings bend. 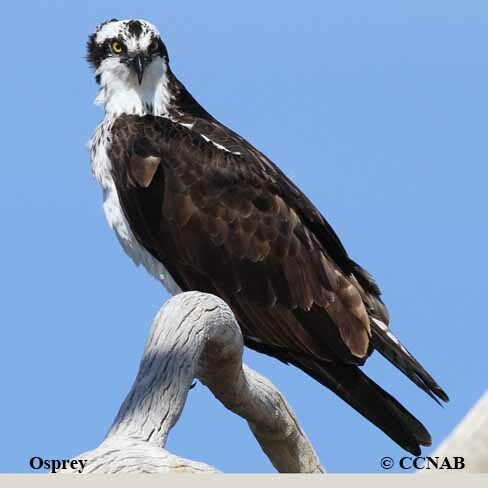 White face with slight crest at back of its head, long curved beak made for tearing into a fish. Dark area behind cheek and side of neck. Brown back and top of tail. Voice: Multiple call notes, sounding like chirps, very recognizable. 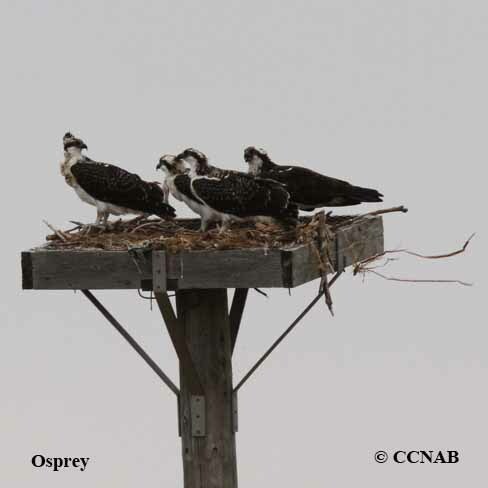 Nesting: Two to three off white and brown spotted eggs, one brood per year. Nest built near waters, in mature trees, man-made platforms, utility poles, or the under carriages of tall bridges. Built very large in nature, using branches, sticks, twigs, leaves and softer materials. Used year after year, where the nest is added to yearly. Distribution: Forty years ago, a very noticeable declined was noted, today because of conservation, their population seems stable. Seen from Newfoundland, through most of Quebec, except in the treeless regions, all the way throughout to the Aleutian Islands in Western Alaska, south into California, throughout the western US states. Along the Atlantic coast and into Florida during the winter months.